Who needs E-Verify when you can appoint an illegal alien to a statewide post? As with a host of other looney, infuriating, and/or illegal things, California is the first state to have done exactly that. The California State Senate has appointed an illegal alien who is both an attorneylegally permitted to practice law in the Golden Stateand an immigrants rights activist (read illegal immigrants rights activist) as a financial aid advisor. Lizbeth Mateo, 33, has been appointed to serve on the California Student Opportunity and Access Program Project Grant Advisory Committee. She was brought to the US by her parents when she was 14, graduated from Santa Clara University Law School in 2016, and passed the California bar last year. The committee needs her to advise them on how California taxpayers can spend more money on illegal immigrants higher education. Technically, her mission is to advise the commission on efforts to increase college access for students from low-income or underserved communities, but we all know what that means. You dont need to wonder if underserved communities is code for illegal alien communities because Ms. Mateo herself tells us it is. While undocumented students have become more visible in our state, they remain underrepresented in places where decisions that affect them are being made." Translation: There are no shadows left in which illegal aliens are forced to live in California, and it is now time for them to take control of the increasingly generous benefits that accrue from their illegal status. In other words, illegal aliens will now be making decisions that affect the rest of us in the form of tax dollars spent on their higher education; reduced college access for American citizens because illegals are in those spots; and fewer low-wage jobs available to working class Americans in college towns that attract illegal aliens by dint of all the education benefits. California makes no bones about its near fanatical mission to elevate illegal immigrants rights above California citizens rights. Phase one, essentially complete, is having no distinctionno advantage, no protection, no rightsof citizenship over non-citizenship. Our beloved Constitution, ironically, goes a long way toward making Californias mission easier. The Supreme Court has ruled that illegal aliens on American soil have due process rights thanks to the Equal Protection Clause of the Fourteenth Amendment. When the ACLU sued the Trump administration to block the removal of DACA recipients, it was based on this reading of the amendment. Phase two, revving its engine, is promoting illegal alien rights at the cost of both public safety and California citizens control over how their tax dollars are spent. California already allows illegals to practice law, get a drivers license, receive in-state tuition, and receive some welfare benefits. If an illegal alien is arrested, the state will even pay his or her legal fees, presumably to the aforementioned illegal alien attorneys. Sanctuary citiesstates, in the case of Californiaare the biggest threat to public safety in the illegal immigrant world. When Oaklands mayor warns illegal immigrants of impending ICE raids, and they scatter, ICE doesnt stop looking for them. The harder they hide, the harder ICE has to look, which puts ICE agents and the public in greater danger as the risk of a standoff in the community increases. It also puts additional illegal aliens at risk for deportation if they are discovered incident to ICE searching the community for the designated illegal aliens. Talk about the law of unintended consequences. California Senate Pro Tempore Kevin de León signaled a triumph of phase two when he announced Ms. Mateos appointment. Ms. Mateo is a courageous, determined and intelligent young woman who at great personal risk has dedicated herself to fight for those seeking their rightful place in this country." Their rightful place? Lets look at Ms. Mateos fight for her rightful place. In 2013, Ms. Mateo was central in helping a group of illegal aliens called the Dream 9 cross the US border illegally after deportation, a felony. While it is a misdemeanor to cross the border illegally, it is a felony to cross illegally after having been deported. She assisted these aliens in the commission of a felony, yet she practices law today. She also advocates abolishing ICE, the agency whose mission is to protect American citizens from illegal immigration. For Ms. Mateo, ICE is an inconvenient reminder that she is, in fact, an illegal alien who has been denied DACA twice thanks to her trip to Mexico for the Dream 9. Her rightful place my eye! California is so hell-bent on defying federal authorities, it looks like secession in the making. Maybe we should help them along. Lets give them back to Mexico before they have the chance to secede. In about two seconds theyll be trying to cross the border into Texas, but Texas, God love them, takes the rule of law seriously. Too bad so sad California elites. You wanted Mexico in California? You get California in Mexico. Enjoy! ICE should go arrest and deport him. The leftards are going to keep upping the ante until they are made to stop. Is sessions ready to to stop them? Not so far. Hiring an illegal alien is clearly illegal. De leon and the mayor of Oakland should be arrested immediately. La Reconquista is out in the open now in California with many public officials fighting that cause to turn the southwest over to Mexico or to make it a Mexican state within the US. When public officials openly and faintly violate the law with impunity there is no rule of law. PS: It was about one year ago today that De Leon announced in the state senate that half of his family was there illegally and he had assisted them in coming and staying here. No investigation, no arrest a year later. So now he is upping his game because the trump administration is weak in arresting law violators. from products of other states. and they do not care. No accountability. Session should issue a warrant for Ms Mateo and ICE should arrest and deport her. Then De Leon should be charged with “conspiracy against the United States” (Mueller’s weasel kind of charge) for intentionally facilitating the criminal alien Ms Mateo. Sounds like clear break in the social contract. Guess I’m free to do whatever I feel like now. 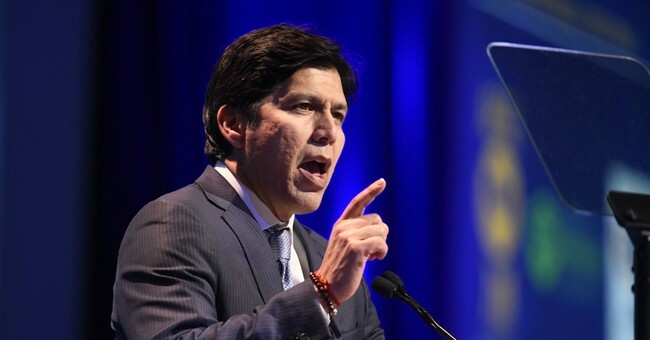 The Illegal Alien is Kevin de Leon. Born to illegal alien parents. Doesn’t matter if it was in the US or Tijuana, which is most likely. The status of children born to illegals in this country has never been adjudicated. Short of that, Trump could issue an EO NOW to stop federal agencies from treating them as citizens. That would be a giant first step, and then Congressional action to clarify the 14th Amendment. And de Leon could be deported. At the very minimum, any law he has ever voted on should be re-examined to see if his vote actually changed the outcome. His vote should hold no weight. The california government is pushing for secession; not to become a separate rupublic, but to become the 32nd state of mexico. Illegal mexicans and legal infiltrators have swamped the state, influenced elections, taken positions within the california government, and have reached critical mass as far as exerting control over the state goes. The socialist-democrats and RINOs in,the state thought that they were going to be in charge of new california republic. They horribly miscalculated. They’ll be the first ones that the federales will line up against the wall and shoot. They seriuosly underestimated just how ruthless the mexican socialists can be. The reconquista will continue. Only the US federal government, and the other 49 states, can put a stop to it. Illegal aliens are underrepresented? They over represented, since they have no more rights to representation by our government than the Russians do, or Iranians for that matter. If they want secession, prepare for a Savannah Campaign. Might be a bit much. Maybe more alomg the lines of Blackjack Pershing. or The Halls Of Montezuma US Marines type operation. So what, now, prevents us from ignoring any law we morally oppose? We only need to cite this precedence to the courts and any cuort will be forced to toss the case. Considering the level of disregard for law, order, and civility that Mexico’s representatives have in California, I’m not so sure. There is not ‘clarification’ needed re: 14th. Merely the plain reading of the English language. All persons born or naturalized in the United States, *and subject to the jurisdiction thereof*, are citizens of the United States and of the state wherein they reside. No state shall make or enforce any law which shall abridge the privileges or immunities of citizens of the United States; nor shall any state deprive any person of life, liberty, or property, without due process of law; *nor deny to any person within its jurisdiction the equal protection of the laws*. Course, then, govt may be expected to read/follow the other ‘neglected’ clauses like ‘shall NOT be infringed’. We only need to cite this precedence to the courts and any court will be forced to toss the case. Morally oppose? Considering 95%+ of govt (all levels) are extra-constitutional, I fail to see why *anyone*, anymore, gives a rip vs. ANY Law. Govt won’t govern itself w/in the construct of the Const. Police are not ‘clean-up’ crews/law-enforcement...not peace-officers’\servants of the People. Why, again, should anyone care about the ‘law’?? As you said, just point to any of the govt cases being neglected in your own case and run it through the levels of the courts on the hypocrisy alone. Thank you for referencing that article Kaslin. As usual, please note that the following critique is directed at the article and not at you. As a side note to this thread, please consider the following. Regarding California steamrolling the rights of its citizens, patriots are reminded that the states have expressly constitutionally given the feds the specific power to guarantee each state a republican form of government, evidenced by the following constitutional clause. "Article IV, Section 4: The United States shall guarantee to every State in this Union a Republican Form of Government [emphasis added], and shall protect each of them against Invasion; and on Application of the Legislature, or of the Executive (when the Legislature cannot be convened) against domestic Violence." Consider that all roads of corruption in the federal and state governments lead to Congress imo. In other words, regardless of the guarantee of Section 4, we're still burdened with a post-17th Amendment ratification, obstructionist Congress left over from the lawless Obama Administration that will predictably not lift a finger to make punitive laws to discourage activist states from trampling citizens' rights. So the first step in cleaning up states like California is that patriots in all states need to finish the job that they started when they elected Trump president. More specifically, patriots now need to be making sure that there are plenty of Trump-supporting candidates on the ballots who will commit to guaranteeing citizens a republican form of government in their respective states, and pink-slip career lawmakers by sending patriot candidate lawmakers to DC on election day 2018. And until the states wake up and repeal 17A, as evidenced by concerns about the integrity of Alabama's and Pennsylvania's special elections, patriot candidates need to win elections by a large enough margin to compensate for possible deep state ballot box fraud and associated MSM scare tactics.